I love it, it's the way I want it, great quality! 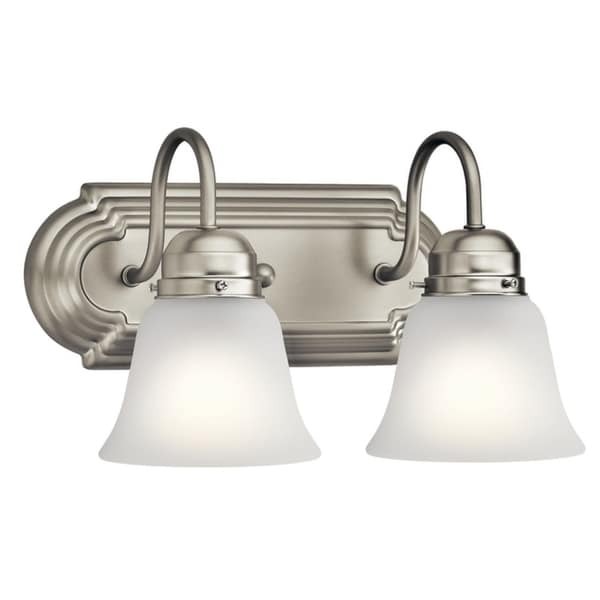 This 2-light bath/vanity light features a brushed nickel finish that will complement many traditional decors. Clean lines of the steel frame add interest while satin etched glass shades soften the light to create a warm ambiance for any bathroom or vanity space. Beautiful Brushed Nickel finish with contrasting Satin Etched glass shades. Dimensions: 8 inches high x 12.25 inches wide x 8 inches deep. Dimensions 8.0 In. X 12.25 In. X 8.0 In. I love this brushed silver double light over the medicine cabinet! All dimensions and installation fit this tiny Vintage 1970 Trailer Home even crozier. I would recommend it to anyone! Very nice looking light fixture. Metal is a little thin, but it's fine. Wiring is easy. Easy to install. 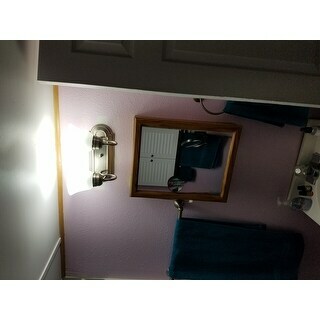 It can be hung as pictured or upside down depending on preference. Looks good on top of my bathroom. Happy with the purchase.